While Romania did not take part in the actual invasion of Yugoslavia, it did provide artillery support for the German forces invading from its territory. Operating on orders from the 3rd Section of the Romanian General Staff, Romanian artillery opened fire against Yugoslav barges on the Danube on 6 April. Romanian and German units from the Romanian bank of the Danube repeatedly exchanged fire with Yugoslav forces between 6 and 11 April. The main Romanian force was at Liubcova, consisting in a battery of 120 mm/L10 naval howitzers in a fortified position. Nearby, there was also a section (2 pieces) of 120 mm/L35 naval howitzers as well as a section of 47 mm light naval guns. The Yugoslavs retaliated with their Air Force. Two Bristol Blenheims raided Arad, badly damaging one of the German fighters stationed there before being both shot down. For its contribution, Romania was rewarded with six ex-Yugoslav aircraft captured by the Germans. These machines, delivered free of charge, were however inoperative. The Romanians cannibalized three of them in order to make the other three operational. The three operational aircraft were all Hawker Hurricanes. ^ a b c Fatutta & Covelli, 1975. The 11th Panzer Division (English: 11th Tank Division) was an armoured division in the German Army, the Wehrmacht, during World War II, established in 1940. The division saw action on the Eastern and Western Fronts during the Second World War. The 11th Panzer Division did not participate in the war until the invasion of Yugoslavia. It fought in the Soviet Union from 1941 to 1944 and, in the last year of the war, in southern France and Germany. The formation's emblem was a ghost. The 294th Infantry Division was a German infantry division in World War II that participated in the invasion of Yugoslavia. The 294th Infantry Division was amalgamated with the 513th Infantry Regiment to create the 513th Grenadier Regiment, on October 15, 1942. The 38th Infantry Division Puglie was a mountain infantry division of the Italian Army during World War II. The Puglie Division was mobilized 15 May 1939 and disintegrated soon after 8 September 1943. The division filled its ranks with men drafted in eastern Veneto and Friuli, with a majority of soldiers hailing from the towns of Sacile and Vittorio Veneto. The only difference between line infantry divisions and mountain infantry divisions was that the latter's artillery was carried by pack mules instead of the standard horse-drawn carriages. Italy's real mountain warfare divisions were the six alpine divisions manned by the "Alpini" mountain troops. The 538th Frontier Guard Division, also known as the Division z.b.V. 538. was a short-lived German division in World War II that participated in the invasion of Yugoslavia. It was disbanded immediately after the Yugoslav surrender. The Axis order of battle for the invasion of Yugoslavia was made up of the various operational formations of the German Wehrmacht and Waffen-SS, Italian Armed Forces and Hungarian Armed Forces that participated in the invasion of Yugoslavia during World War II, commencing on 6 April 1941. It involved the German 2nd Army, with elements of the 12th Army and a panzer group combined with overwhelming Luftwaffe (German Air Force) support. The eighteen German divisions included five panzer divisions, two motorised infantry divisions and two mountain divisions. The German force also included two well-equipped independent motorised regiments and was supported by over 800 aircraft. The Italian 2nd Army and 9th Army committed a total of 22 divisions, and the Royal Italian Air Force (Italian: Regia Aeronautica) had over 650 aircraft available to support the invasion. The Hungarian 3rd Army also participated, with support from the Royal Hungarian Air Force (Hungarian: Magyar Királyi Honvéd Légierő, MKHL). The Axis ground forces had effectively surrounded the Kingdom of Yugoslavia before the invasion began. The German 2nd Army, consisting of one motorised, one mountain, and two infantry corps was concentrated in southwestern Hungary and southeastern Austria, poised to drive south and east. One motorised corps of the German 12th Army was assembled near Sofia, Bulgaria, along with one motorised corps of the First Panzer Group, and these formations were assigned the task of striking the strongest Yugoslav formations stationed along the eastern border of the country. A further motorised corps was deployed near Timișoara in western Romania, ready to thrust south into the Banat region. The Italian 2nd Army, consisting of one fast (Italian: celere) corps, one motorised corps and three infantry corps was assembled in northeastern Italy, with the task of driving southeast down the Dalmatian coast. 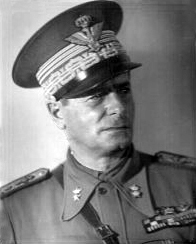 The Italian 9th Army, comprising two corps and a sector defence command, was stationed in occupied northern Albania, and its stance was largely defensive. The Hungarian 3rd Army was concentrated along the Yugoslav border largely between the Danube and the Tisza, with the objective of seizing the Bačka and Baranja regions. German, Italian and Hungarian air support was concentrated in Austria, Italy, southern Hungary, southern Romania, western Bulgaria and Albania. In total, over 1,500 Axis aircraft were available to support the invasion. Naval forces were limited to a few destroyers of the Royal Italian Navy (Italian: Regia Marina) operating in the Adriatic Sea. Kiril "Džina" Simonovski (Macedonian: Кирил Симоновски - Џина, 19 October 1915 – 12 June 1984) was a Macedonian footballer. He played top league football for Gragjanski Skopje, Macedonia Skopje, FK Vardar and FK Partizan. He started playing football in a local club in Skopje named FK Jug, before moving to Gragjanski Skopje in 1938. In 1941, during World War II and the Axis invasion of Yugoslavia, most of the region of the then Vardarska Banovina was occupied by the Bulgarian forces and in that period Gragjanski was renamed to Makedonija Skopie. The club finished in second place in the 1942 Bulgarian State Championship, and during this period Simonovski played two matches for the Bulgarian national team (as Kiril Simeonov). At the end of the war, Simonovski moved to Belgrade and signed with newly formed FK Partizan where he will play all the way until 1950, winning two national championships and one cup. It was in this period that he became the first Macedonian to play for the post-1945 Yugoslav national team, having played a total of 10 matches and scored once. After retiring he became a coach. He coached FK Partizan, FK Vardar and Olympiacos F.C. among several other clubs in Yugoslavia, Greece and Cyprus. LI Army Corps (German: LI. Armeekorps) was an infantry corps of the German Army during World War II that participated in the invasion of Yugoslavia. It was also present at the Battle of Stalingrad, where it was commanded by General Walther von Seydlitz-Kurzbach. After von Seydlitz-Kurzbach instructed his officers on 25 January 1943 that the question of surrender was their personal choice to make, he was relieved of command. The Royal Yugoslav Army (Serbo-Croatian: Vojska Kraljevine Jugoslavije, Југословенска Краљевска Војска) was the armed force of the Kingdom of Serbs, Croats and Slovenes (later the Kingdom of Yugoslavia) from the state's formation in December 1918 until its surrender to the Axis powers on 17 April 1941. Aside from fighting along the Austrian border in 1919–20 related to territorial disputes, and some border skirmishes on its southern borders in the 1920s, the VKJ was not involved in fighting until April 1941 when it was quickly overcome by the German-led invasion of Yugoslavia. Shortly before the Axis invasion of Yugoslavia, certain high ranking army and airforce officers, backed by Great Britain, staged a coup against the Yugoslav monarchy on 27 March. Beyond the problems of inadequate equipment and incomplete mobilization, the Royal Yugoslav Army suffered badly from the Serbo-Croat schism in Yugoslav politics. "Yugoslav" resistance to the invasion collapsed overnight. The main reason was that neither of the non-Serb national groups (Slovenes and Croats) were prepared to fight in defence of what they viewed as Serbian-dominated Yugoslavia. The only effective opposition to the invasion was from wholly Serbian units within the borders of Serbia itself. In its worst expression, Yugoslavia's defenses were badly compromised on 10 April 1941, when some of the units in the Croatian-manned 4th and 7th Armies mutinied, and a newly formed Croatian government hailed the entry of the Germans into Zagreb the same day.During the occupation of Yugoslavia, the Chetniks of Draža Mihailović were referred to as the "Yugoslav Army in the Homeland". The Royal Yugoslav Army was formally disbanded on 7 March 1945 when the Yugoslav government-in-exile appointed by King Peter II was abolished. The VI Corps (Italian: VI Corpo d'Armata) was a corps of the Royal Italian Army during World War II that participated in the invasion of Yugoslavia. The XI Army Corps (Italian: XI Corpo d'Armata) was a corps of the Royal Italian Army during World War II that participated in the invasion of Yugoslavia. The XVII Army Corps (Italian: XVII Corpo d'Armata)was an infantry corps of the Royal Italian Army during World War II that participated in the invasion of Yugoslavia (6–18 April 1940). It was formed on 1 March 1940 from the Armoured Corps (Corpo d'Armata Corrazzato) of the reserve Army of the Po and sent to the Albanian front. The Yugoslav order of battle before the invasion of Yugoslavia includes a listing (or order of battle) of all operational formations of the Royal Yugoslav Army (Serbo-Croatian: Vojska Kraljevine Jugoslavije, VKJ), Royal Yugoslav Army Air Force (Serbo-Croatian: Vazduhoplovstvo Vojske Kraljevine Jugoslavije, VVKJ) and Royal Yugoslav Navy (Serbo-Croatian: Kraljevska Jugoslovenska Ratna Mornarica, KJRM) immediately prior to the World War II invasion of that country in April 1941. The VKJ consisted of 33 divisions and a significant number of smaller formations, but due to tentative and incomplete mobilisation, only seven divisions and four smaller formations are known to have been at close to fighting strength and in their planned deployment locations when the German-led Axis assault commenced on 6 April 1941. The Yugoslav defence plan involved placing the bulk of its land forces close to its borders, with very limited strategic reserves in depth. Almost all of the divisions that had been effectively mobilised were concentrated in the 3rd Army Group deployed in the east of the country along the Romanian and Bulgarian borders between the Iron Gates and the Greek border. Most of the heavy weapons and armoured vehicles available to the VKJ were obsolete, most formations were heavily reliant on animal-powered transport, and the VKJ had only 50 tanks that could engage front line German tanks on an equal basis. By 6 April 1941, the VVKJ had been almost completely mobilised, and consisted of four air brigades with more than 423 aircraft of Yugoslav, German, Italian, French, Czech and British design, including 107 modern fighter aircraft, and 100 modern medium bombers. Other than a small number of locally made Rogožarski IK-3 fighters, almost all the modern aircraft available to the VVKJ were of German, Italian or British design for which limited spares and munitions were available. The KJRM consisted of a flotilla of river monitors based on the Danube and a small fleet based in several ports along the Adriatic coast. The blue-water navy centred on a flotilla leader, three smaller destroyers, four obsolescent submarines and a gunboat, supplemented by minelayers and torpedo boats. Some of the smaller vessels in the Yugoslav fleet had been inherited from the defeated Austro-Hungarian Empire following World War I and were obsolete. ŽAK Subotica (Serbian Cyrillic: ЖAK Cубoтицa) was a football club based in Subotica, Kingdom of Yugoslavia.The club was formed in 1921 and the name comes from the initials of Železničarski atletski klub derived from the fact that the club was backed by the Yugoslav Railways company.It played in the 1935–36 Yugoslav Football Championship where it was eliminated in the round of sixteen by Slavija Osijek. Afterwards, it played in the 1940–41 Serbian League where it finished 5th out of 10. With the start of the Second World War and the Axis invasion of Yugoslavia, the city came under Hungarian occupation and the club competed in the Hungarian Second League under its Hungarian translated name, Szabadkai Vasutas AC. During this period the coach was Geza Takács and among its best known players was István Nyers who begin his senior career at the club. After the end of the Second World War, the club made a tour throughout Serbia in order to prepare for competition, however the new socialist authorities demanded that most of the pre-1945 clubs to be desbanded and new clubs to be formed. ŽAK was dissolved in 1945 and its players made a meeting where they decided to join the newly founded FK Spartak Subotica which beside the players, the stadium, the colors and the fans, it also inherited the tradition of being backed by the railways.